Treasury has implemented programs to allow families to save on their mortgage payments by refinancing, assist responsible homeowners in avoiding foreclosure through a loan modification plan, and, alongside the Federal Reserve, help bring mortgage interest rates down to near historic lows. This past month, the 30% increase in mortgage refinancing demonstrated that working families are benefiting from the savings due to these lower rates. Markets: Treasury and the Federal Reserve are expanding the TALF in conjunction with the Federal Reserve to jumpstart the secondary markets that support consumer and business lending. Last week, Treasury announced its plans to purchase up to $15 billion in securities backed by Small Business Administration loans. capital program, including a forward-looking capital assessment undertaken by bank supervisors to ensure that banks have the capital they need in the event of a worse-than-expected recession. If banks are confident that they will have sufficient capital to weather a severe economic storm, they are more likely to lend now -- making it less likely that a more serious downturn will occur. The Challenge of Legacy Assets: Despite these efforts, the financial system is still working against economic recovery. One major reason is the problem of “legacy assets” -- both real estate loans held directly on the books of banks (”legacy loans”) and securities backed by loan portfolios (”legacy securities”). These assets create uncertainty around the balance sheets of these financial institutions, compromising their ability to raise capital and their willingness to increase lending. assets began with an initial shock due to the bursting of the housing bubble in 2007, which generated losses for investors and banks. Losses were compounded by the lax underwriting standards that had been used by some lenders and by the proliferation of complex securitization products, some of whose risks were not fully understood. The resulting need by investors and banks to reduce risk triggered a wide-scale deleveraging in these markets and led to fire sales. As prices declined, many traditional investors exited these markets, causing declines in market liquidity. cycle has developed where declining asset prices have triggered further deleveraging, whi ch has in turn led to further price declines. The excessive discounts embedded in some legacy asset prices are now straining the capital of U.S. financial institutions, limiting their ability to lend and increasing the cost of credit throughout the financial system. The lack of clarity about the value of these legacy assets has also made it difficult for some financial institutions to raise new private capital on their own. To address the challenge of legacy assets, Treasury -- in conjunction with the Federal Deposit Insurance Corporation and the Federal Reserve -- is announcing the Public-Private Investment Program as part of its efforts to repair balance sheets throughout our financial system and ensure that credit is available to the households and businesses, large and small, that will help drive us toward recovery. government financing in partnership with the FDIC and Federal Reserve and co-investment with private sector investors, substantial purchasing power will be created, making the most of taxpayer resources. Second, the Public-Private Investment Program ensures that private sector participants invest alongside the taxpayer, with the private sector investors standing t o lose their entire investment in a downside scenario and the taxpayer sharing in profitable returns. that the government will overpay for these assets, private sector investors competing with one another will establish the price of the loans and securities purchased under the program. The Merits of This Approach: This approach is superior to the alternatives of either hoping for banks to gradually work these assets off their books or of the government purchasing the assets directly. Simply hoping for banks to work legacy assets off over time risks prolonging a financial crisis, as in the case of the Japanese experience. But if the government acts alone in directly purchasing legacy assets, taxpayers will take on all the risk of such purchases -- along with the additional risk that taxpayers will overpay if governme nt employees are setting the price for those assets. balance sheets has made it difficult for banks to access private markets for new capital and limited their ability to lend. illiquid, and are trading at prices below where they would be in normally functioning markets. These securities are held by banks as well as insurance companies, pension funds, mutual funds, and funds held in individual retirement accounts. The Legacy Loans Program: To cleanse bank balance sheets of troubled legacy loans and reduce the overhang of uncertainty associated with these assets, the Federal Deposit Insurance Corporation and Treasury are launching a program to attract private capital to purchase eligible legacy loans from participating banks through the provision of FDIC debt guarantees and Treasury equity co-investment. 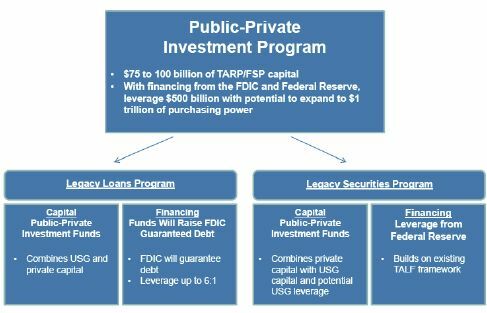 Treasury currently anticipates that approximately half of the TARP resources for legacy assets will be devoted to the Legacy Loans Program, but our approach will allow for flexibility to allocate resources where we see the greatest impact. investors are expected to participate in the Legacy Loans Program. The participation of individual investors, pension plans, insurance companies and other long-term investors is particularly encouraged. The Legacy Loans Program will facilitate the creation of individual Public-Private Investment Funds which will purchase asset pools on a discrete basis. The program will boost private demand for distressed assets that are currently held by banks and facilitate market-priced sales of troubled assets. oversight for the formation, funding, and operation of these new funds that will purchase assets from banks. Treasury and private capital will provide equity financing and the FDIC will provide a guarantee for debt financing issued by the Public-Private Investment Funds to fund asset purchases. The Treasury will manage its investment on behalf of taxpayers to ensure the public interest is protected. The Treasury intends to provide 50 percent of the equity capital for each fund, but private managers will retain control of asset management subject to rigorous oversight from the FDIC. the process, banks will decide which assets -- usually a pool of loans -- they would like to sell. The FDIC will conduct an analysis to determine the amount of funding it is willing to guarantee. Leverage will not exceed a 6-to-1 debt-to-equity ratio. Assets eligible for purchase will be determined by the participating banks, their primary regulators, the FDIC and Treasury. Financial institutions of all sizes will be eligible to sell assets. will conduct an auction for these pools of loans. The highest bidder will have access to the Public-Private Investment Program to fund 50 percent of the equity requirement of their purchase. seller accepts the purchase price, the buyer would receive financing by issuing debt guaranteed by the FDIC. The FDIC-guaranteed debt would be collateralized by the purchased assets and the FDIC would receive a fee in return for its guarantee. assets have been sold, private fund managers will control and manage the assets until final liquidation, subject to strict FDIC oversight. Step 3: The pool would then be auctioned by the FDIC, with several private sector bidders submitting bids. The highest bid from the private sector -- in this example, $84 -- would be the winner and would form a Public-Private Investment Fund to purchase the pool of mortgages. Step 6: The private investor would then manage the servicing of the asset pool and the timing of its disposition on an ongoing basis -- using asset managers approved and subject to oversight by the FDIC. (TALF) and through matching private capital raised for dedicated funds targeting legacy securities. Back into the Market: The Treasury and the Federal Reserve are today announcing their plans to create a lending program that will address the broken markets for securities tied to residential and commercial real estate and consumer credit. The intention is to incorporate this program into the previously announced Term Asset-Backed Securities Facility (TALF). Legacy Assets:As with securitizations backed by new originations of consumer and business credit already included in the TALF, we expect that the provision of leverage through this program will give investors greater confidence to purchase these assets, thus increasing market liquidity. (RMBS) that were originally rated AAA and outstanding commercial mortgage-backed securities (CMBS) and asset-backed securities (ABS) that are rated AAA. meet eligibility criteria. Haircuts will be determined at a later date and will reflect the riskiness of the assets provided as collateral. Lending rates, minimum loan sizes, and loan durations have not been determined. These and other terms of the programs will be informed by discussions with market p articipants. However, the Federal Reserve is working to ensure that the duration of these loans takes into account the duration of the underlying assets. Securities Investment Funds: Treasury will make co-investment/leverage available to partner with private capital providers to immediately support the market for legacy mortgage- and asset-backed securities originated prior to 2009 with a rating of AAA at origination. will approve up to five asset managers with a demonstrated track record of purchasing legacy assets though we may consider adding more depending on the quality of applications received. Managers whose proposals have been approved will have a period of time to raise private capital to target the designated asset classes and will receive matching Treasury funds under the Public-Private Investment Program. Treasury funds will be invested one-for-one on a fully side-by-side basis with these investors. managers will have the ability, if their investment fund structures meet certain guidelines, to subscribe for senior debt for the Public-Private Investment Fund from the Treasury Department in the amount of 50% of total equity capital of the fund. The Treasury Department will consider requests for senior debt for the fund in the amount of 100% of its total equity capital subject to further restrictions. Step 1: Treasury wi ll launch the application process for managers interested in the Legacy Securities Program. Step 5 : As a result, the fund manager has $300 (or, in some cases, up to $400) in total capital and commences a purchase program for targeted securities. Step 6: The fund manager has full discretion in investment decisions, although it will predominately follow a long-term buy-and-hold strategy. The Public-Private Investment Fund, if the fund manager so determines, would also be eligible to take advantage of the expanded TALF program for legacy securities when it is launched.